Here is my Opel Astra grille block. It´s made 3mm thick black coroplast and I installed it with cable tie. Average fuel consumption drops about 0.1-0.2 liter /100km. Nice one! 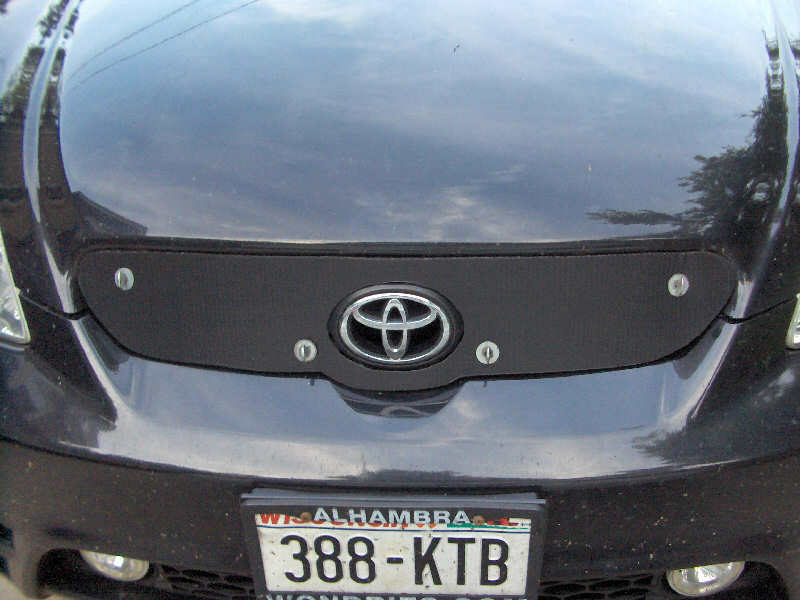 What is it on the front left corner of your bumper? It looks like some plug cover. Coolant heater plug? Plug is for engine block heater. Here in Finland is sometimes cold in winter and block heater heps to start engine. It´s also reduce fuel consumption on cold weather, because engine reach up faster normal operating temperature. Here's my "Upper Grill Block"... if you can count it as that?? I dont have any experience with forced induction, but your engine will never go lean unless there are component failures. Your o2 sensors will keep the fuel mixture in the correct range. Those horror stories are from people building and tuning engines. The O2 sensor feedback is only enabled when the engine is running in closed loop. It's in closed loop when cruising, idling, or with relatively small changes to the gas pedal. Even so, the fuel delivery can only be "trimmed" within a certain range. Hard acceleration with flip the ECU into open loop where the O2 sensors are not part of the fueling process - instead a set of fixed tables are used. So, yes, the engine can go lean (or rich) if one messes with the assumptions used by the manufacturer to set up the ECU programming. This is my upper grillblock. I've made it from 5mm scrap aluminum. I fits nicely and run it trough the heatwaves. Only in standing traffic the fan comes on to cool it down again and turning off. Only to slowly warm up over a 40 50 seconds time. Caution! With modern cars, controlling water temperature is not the only reason for underhood air flow. Electronics can also (easily) overheat, and (less easily) batteries too. Styling, FWD, exterior aero all have the makers squishing down underhood volume far more than in the past with a consequent rise in temperatures, even with the stock cooling air inlets. On my RX-8 for example, there are cooling ducts from the lower radiator intake to both a box containing a bunch of electronic modules and to the box containing the battery. Likewise, on my Chevy Volt, blocking the upper grill opening can damage the inverter and its controlling electronics. 99 Metro. Cardboard, woohoo. 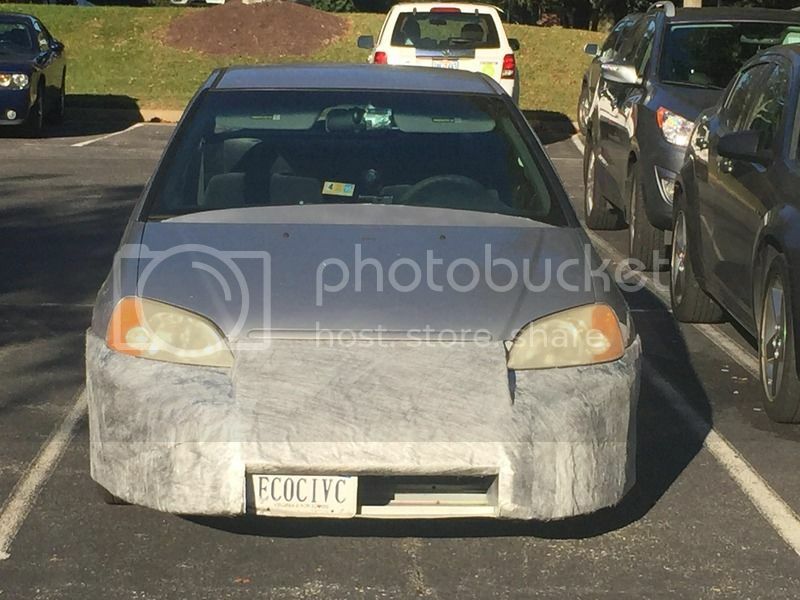 It has held up for a year now... well the driver's side at least. I'm not sure how, but I lost the passenger side block zip ties and all. 04 Prius. This one has been on for a couple years. Its coroplast. 97 Paseo. Ran a full grill block on that car for the longest time. 2003 Matrix. Another coroplast creation. It held up very well too. Here is my 2015 Mirage. Duct tape! Wanted to see what results I could get, before I made a Coroplast cover. Since the CR-Z has absolutely no gauges to monitor what is going on underhood, I temporarily moved the ambient sensor into the engine compartment so I could get an idea as to what it is doing. 88 degrees is the highest I've seen so far. There is no other way for air to get in, besides the grille, so the bottom row of the grille is still open. I'm already happy with how it is performing, and hope to change to Coroplast over Thanksgiving weekend. Last edited by ExDelayed; 11-20-2015 at 12:47 PM.. I watched a little NAStruck racing today on TV, pretty sure they were all grille blocked. Fake grilles to match the fake headlights and taillights. I hate to mention but, you'd be better off with SHARK TEETH on that simple but desiring art canvas you have there !